This is the length of the summerhouse, either to the side of the entrance (door). This is the length of the building towards the back. These are the sides without the main entrance. Do you have a specific roof type in mind? Use the roof type filter. Depending on the construction system and the size of the product there are several wall thicknesses available. Thicker walls create among other things a better stability and insulation. Need more storage options in your garden? Then a log cabin shed is the perfect solution. But a shed bring more to your garden then only a new storage space. It also gives your garden a completely new look and more charisma. 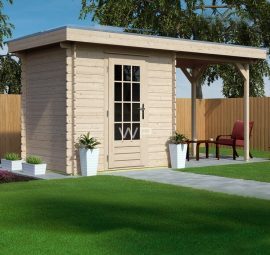 Discover how the log cabin sheds from Woodpro can transform your garden. 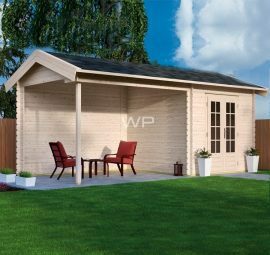 Why buy a log cabin shed? A wooden shed offers many possibilities. For example, in the winter it can be used to store garden furniture or valuable tools. Your furniture will stay dry and clean in this closed construction, making it possible to enjoy the furniture and equipment for a longer period of time. Of course you can also use the structure during warmer periods. 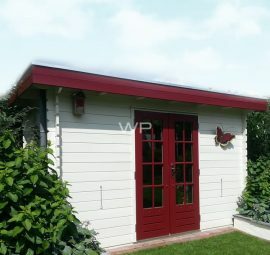 Imagine using the shed as a place for an extra fridge or freezer. Here you can store your cool drinks and ice cubes. These are then easier to reach when your are relaxing in your sunny garden. 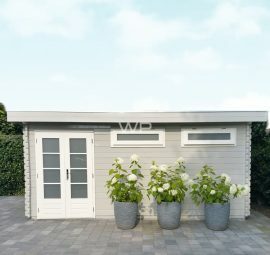 But a garden shed is more then a simple storage space in your garden. This type of wooden construction gives your garden new allure. Depending on the style of the building, a log garden shed can create a different kind of look. And you can even build a log garden shed with canopy. Here you have the perfect place to sit down and relax, while escaping the burning sun in the summer or the cool raindrops during colder seasons. Do you prefer a cosy and classical sitting space next to your log cabin? 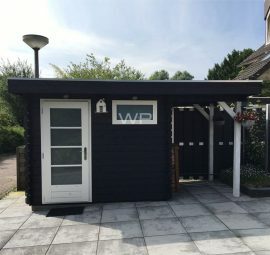 Or do you rather buy a more modern looking shed? At Woodpro you can find it all. The roof type of the log cabin shed has much influence on the look of the construction. 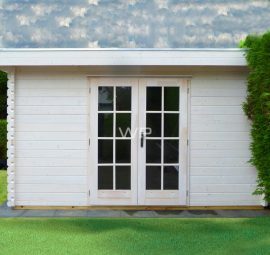 At Woodpro you can choose between an apex roof, asymmetrical roof, flat roof or a pent roof. Not only do these different roofs change in appearance, they also differ in possibilities. Our apex roofs are delivered with purlins, a complete package of standard fittings, metal components, fascia boards and shingles. These shingles come in five different colours: red, brown, black, green or blue. Simply choose the colour that fits your garden and house. Flat roof or asymmetrical roof? A flat roof is standard delivered with a EPDM protection layer. Also a aluminium roof trim, EPDM roof felt, water outlet and bitumen kit are always supplied. A flat roof with EPDM cover is known for its extreme durability. Because of this type of protection, the roof hardly requires any care and is very resistant to UV radiation. Our asymmetrical roofs have two uneven sides and are delivered with a high-quality ridge cover and also shingles are included. Also here you can choose between the five different colour options as stated above. The last option is a pent roof style. This type of construction slopes away to the back. A pent roof is also delivered with a EPDM kit. 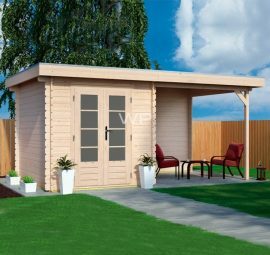 The quality of the construction is an important element when you want to buy a log cabin shed. Especially in the UK where rain falls down on a regular basis. Obviously you don’t want any leaks that can damage your valuable belongings. That why at Woodpro we only use high-quality wood and accessories. This wood is much less vulnerable to weather influences that can decrease the quality of the building. Keep your equipment, furniture and tools safe and intact. 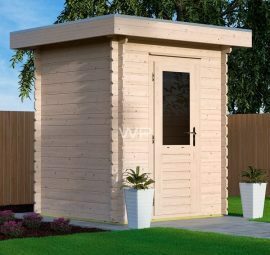 Choose for the premium quality log cabin sheds from Woodpro. To prevent that the wood will decrease in quality, excellent treatment is also very valuable. At Woodpro different treatment options are possible. All included foundation beams are pressure treated and require no further treatment. It is optional to protect the walls with spray-treatment. The big advantage is that because of this the whole building is treated, including the parts that cannot be reached after installation. 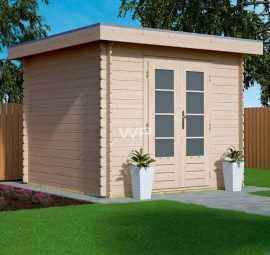 With spray treatment your log cabin shed is protected against fungi and the rotting process. You can choose between four different transparent colours. It is still suggested to paint the outside within a year, to protect the building against weather influences. 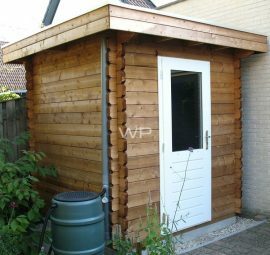 The last treatment option for your log garden shed is pressure treatment. After this, additional treatments such as staining are not necessary anymore. Pressure treatment forces the fluid into the wood and offers more protection. After a while the wood will turn grey. The wood still can be stained if you don’t prefer this colour. Windows and door of your log cabin shed will not be pressure treated. 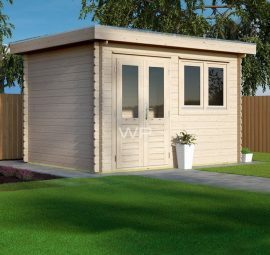 Do you buy a log cabin shed without or with storage options at Woodpro? Then you will receive a construction made form top-quality wood. We only use wood from northern regions in Europe. In this areas it is often ice cold. Because of this colder climate, the wood grows much slower. This creates more delicate annual growth rings, making the wood more durable. Also our wood is dried to approximately 14-16% moisture content. Because of this the (possible) shrinkage of the wood is reduced. Ultimately this results in a much stronger construction. Furthermore, we think durability is extremely important. All of our wooden buildings are recyclable. And at Woodpro we reduce wood waste by using residual wood for other purposes. 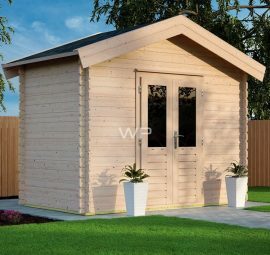 Buy a log cabin shed at Woodpro and choose for a durable and high-quality structure. 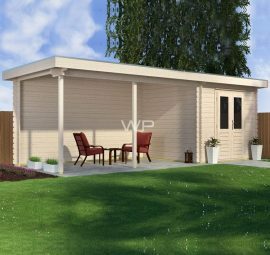 At Woodpro we have many decennia of experience with building wooding constructions for your garden. We produce and design all buildings by ourselves. Because of this we can offer our customers high-quality sheds against low prices. 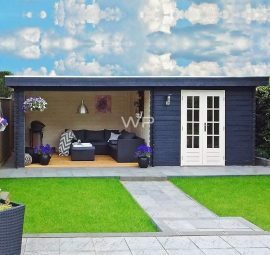 Want to find the garden shed of your dreams? Then simply browse our website and use our user-friendly filter options. 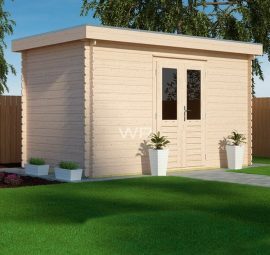 You can simply select options such as the width, depth, roof style and wall thickness. Need help finding the perfect garden construction? Then you can also download or new inspiration brochure. Or do you know already how the perfect log cabin shed should look like? Then simply make use of our 3D-Configurator. Simply select a base construction and add or remove all necessary elements. For help you can always contact the experts of Woodpro via telephone or e-mail. 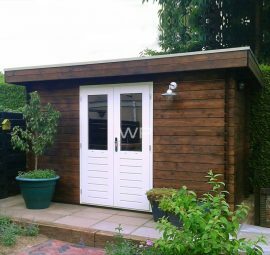 "My garden studio is built in one day by a Woodpro dealer. The installation was easy and the assembly material was excellent!" After 20 years I had to take down my old shed. 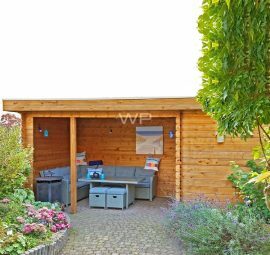 With this gazebo from Woodpro my garden completely changed." 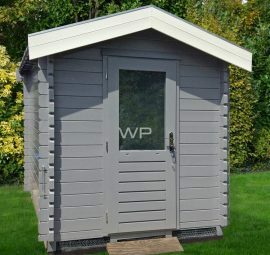 Woodpro offers a wide range of summerhouses, log cabins, pavilions and garages. You would like to receive our free catalogue? Then please fill out the contact form below or view our catalogue online.